Pandit Dr. Nagaraj Rao Havaldar of Kirana Gharana, a disciple Pt. Madhava Gudi. He has a subtle understanding of a scholar and the finesse of an aesthete. Gifted with a voice that traverses three octaves, his music has a powerful emotional and intellectual appeal. Panditji has performed across India, at festivals such as the Hampi Utsav (Karnataka), Sankat Mochan Sangeet Samaroh (Benaras), Salt Lake Music Festival (Kolkata) etc. He has toured the U.S. and the U.K. extensively. Dr.
Omkar was enthused by his parents, both being Marathi Natya-Sangeet performers. 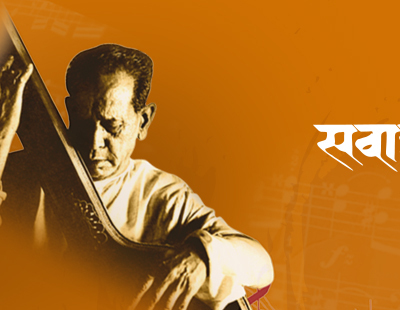 He trained under his aunt legendary Manik Verma, Pt.Yashwantbua Joshi of Gwalior Gharana and Pt.Ulhas Kashalkar. Omkar's performancesacross India and abroad were highly applauded. He received the prestigious Vidyasagar Award, Shanmukhananda Hall-Mumbai-Sangeet Shiromani" award, Chaturanga Sangeet Shishyavrutti Award", Sangeet Natak Academy Awarf and Ustad Bismillah Khan Yuva Puraskar. Presently he is a Musician Tutor at I.T.C. Sangeet Research Academy Kolkata. One of the finest and outstanding artists in the field of music, violin virtuoso Padmabhushan Dr. Smt. N. Rajam needs no introduction. Her magical fingers enchant the tuneful strings of the violin to create a divine and sublime atmosphere. She has brought out a new realm into the world of classical music by introducing the "Gayaki Ang", a technique which presents the vocal style of music on the violin. Dr. Rajam has been honored with the Padmabhushan award, Sangeet Natak Akademi award, Padmashri to name a few. She has performed around the globe and has many CDs to her credit. M. Venkateshkumar grew up in an ancestral folk tradition. He mastered the nuances of Kirana and Gwalior Gharana singing under Pandit Puttaraj Gawai. Venkateshkumar is gifted with a mellifluous, robust and vibrant voice, rich in tradition, deep in devotion and dexterous in Bhava. His versatile performances have captivated the audience in almost all major music festivals. His cassettes and CDs are all time favourites all over Karnataka. Presently, he is a faculty at Karnatak College of Music, Dharwad. Padma Deshpande enriched her art Khayal, Thumri, Bhajan and natya Sangeet from Late Sawai Gandharva, Smt. Hirabai Badodekar, Smt Saraswatibai Rane amd Mr. Vijay Karandikar. Thoughtful Riyaz have made her performances impressive and enchanting. She has performed on prestigious music platforms across India and has secured honorable grade in classical music at All India Radio. She has won numerous contest such as Kalidas Sangeet Spardha, Sur Shree Pratishthan Sangeet Spardha and has bestowd by titles Surmani and Sangeet Shree.